1. 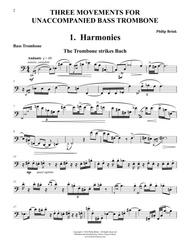 Harmonies - subtitled "The Trombone Strikes Bach" is pensive in mood and in the style of an Unaccompanied Prelude by Bach. 2. Balooze - subtitled "A Sort of Soliloquoy" is in a swung blues-style including a free cadenza-like introduction. 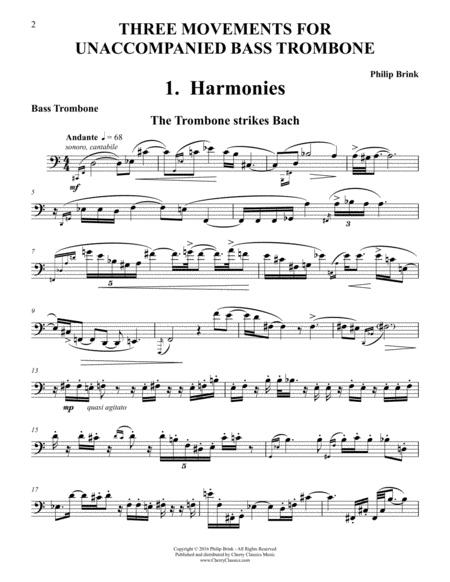 It also includes a foot tapping accompaniment and multiphonics, reminiscent of Bernstein's Mippy II. 3. Rhythmus - "Movement At High Speed", the finale is in a Presto tempo with lots of technical wizardry for the performer. This very fine work of about 7-minutes in length is appropriate for advanced performers.